Vladimir Putin’s third term as Russia’s president had already been marked by clear signs of his intention to reassert his country as a world power before his move to annex Crimea. But whatever impact the latest events have on international opinion about Putin, views about him in the U.S. and allied countries had already turned negative compared with when he was first elected to office in 2000. A Gallup poll conducted Feb. 6-9 found that 63% of Americans had an unfavorable view of Putin, the highest ever in its polling. That followed a year of U.S.-Russian tensions that included sharp differences over Syria, Russia’s decision to grant asylum to NSA leaker Edward Snowden and Putin’s op-ed piece in the New York Times taking issue with President Obama’s evocation of American exceptionalism. More than a decade ago, the polling showed a different picture of Russia’s leader. In 2002, 41% of Americans had favorable views of Putin and just 18% had a negative one in Gallup’s polling. Gallup’s results on Putin have been echoed in polls since January by CNN and the Washington Post/ABC News and continued a negative trend reflected in polling by the Pew Research Center. Asked how much confidence they had in Putin to do the right thing in world affairs, 54% of Americans answered “not too much” or “none at all” in a 2012 survey, an increase of seven points compared with 2003. In 2012, just 28% said they had “a lot” or “some” confidence in the Russian leader. 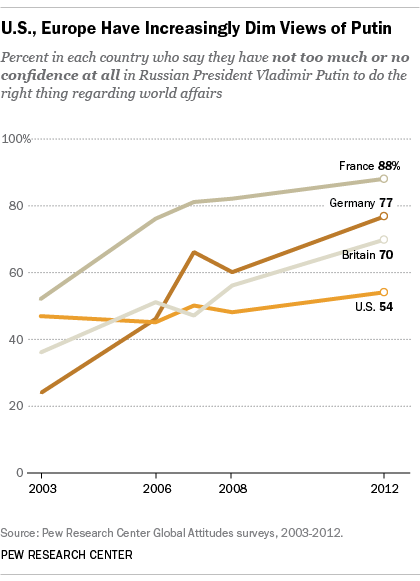 But the public opinion changes were even more marked among the U.S.’s allies in Europe. In Britain, those saying they had little or no confidence in Putin to do the right thing jumped to 70% in 2012 from 36% in 2003; in France, it increased to 88% from 52%; and, in Germany, to 77% from 24%. In Poland, where its neighbor’s intentions have been a concern since Soviet times, 74% of the public said they had little or no confidence in Putin to do the right thing, similar to findings in 2008 and 2007.